This week at ASB we hosted 2 candidates for the Assistant Superintendent position for next school year. One of the areas that will fall under the new position is to imagine and create a center for life-long learning. This will involve the development of alternative and innovative educational paths for anytime-anywhere learning. ASB has already started on this journey. We already have service learning programmes, year round educational experiences such as internships and intersessions, and online learning for students, teacher and parents. In his book Twenty-One Trends for the 21st Century, one of the issues Gary Marx writes about is the depth, breadth and purposes of education in a fast-changing world. He, like the leadership of ASB, asks "What are the purposes of education?" At a recent State of the School meeting with parents this question was raised by our Superintendent. Traditionally we say that education should prepare students for the future. The question that Craig Johnson asked was "What future?" Are we preparing students for their future here at ASB? For their future in another school, as our students' families are highly mobile? For their future at university? For their life? Stimulating imagination, creativity and inventiveness. Yesterday and today our Twitter PYP chat was about transdisiplinary learning. As always it was great to have a discussion with so many educators about this. Reflecting on our conversations, I noticed that Marx is also a proponent of learning across disciplines. He writes, "It's in those multidisciplinary white spaces, in the connective tissue, that we are likely to discover new knowledge. Teaching and learning across disciplines should be considered part of how we operate." 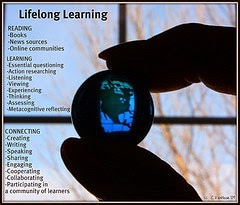 Is this how the new center of life-long learning is going to operate at ASB? Looking at ASB's website we already pride ourselves on being a center of learning for students, educators and thought leaders from around the world, in an environment where all members are constantly in pursuit of personal and professional growth and development. In addition we are building global communities of learners and researchers through sharing data, content, tools and ideas with colleagues and schools around the world. ASB also hosts a range of educational conferences and learning events, from our Maker Saturdays, TRAI Summits, Global Social Entrepreneurship Summits and TEDx ASB events for students, to conferences such as ASB Un-Plugged, Future Forwards, InspirED and the Google Summits for educators from India and around the world. Last weekend I was involved in the Teacher Training Program at ASB. Our Mission calls on us to "enhance the lives of others" and this is one way I feel I can give back to the Indian community. The TTP is a 2 year program for Indian teachers who are working in partner NGOs. The program is taught by ASB staff and introduces to Indian teachers new ideas and critical skills for teaching in the 21st century. Our journey towards becoming a center for life-long learning has begun. I'm interested to see who is the person who will be taking us forward.